Color image taken with the Hubble Space Telecope’s WFPC2 camera, showing the dumbbell-shaped cloud of gas and dust around the star. This nebula contains more than 10 times the mass of our Sun, which was ejected by Eta Carinae in the 19th century Great Eruption. Image credit: N. Smith (U. Arizona) and NASA. Observations from the Gemini South and other telescopes in Chile played a critical role in understanding light echoes from a stellar eruption which occurred almost 200 years ago. Gemini spectroscopy shows that ejected material from the blast is the fastest ever seen from a star that remained intact. Imagine traveling to the Moon in just 20 seconds! That’s how fast material from a 170 year old stellar eruption sped away from the unstable, eruptive, and extremely massive star Eta Carinae. Astronomers conclude that this is the fastest jettisoned gas ever measured from a stellar outburst that didn’t result in the complete annihilation of the star. This sequence of images show’s an artist’s conception of the expanding blast wave from Eta Carinae’s 1843 eruption. The first image shows the star as it may have appeared before the eruption, as a hot blue supergiant star surrounded by an older shell of gas that was ejected in a previous outburst about 1,000 years ago. 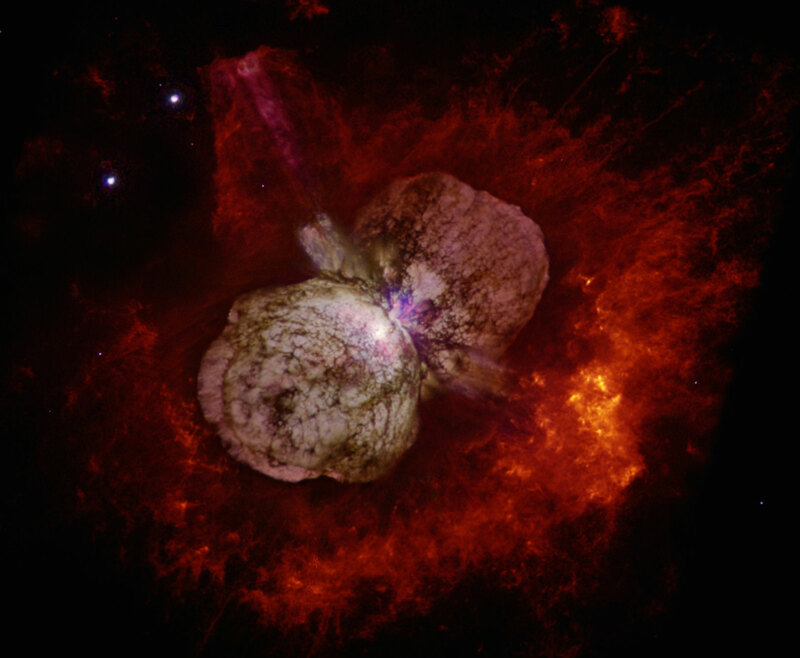 Then in 1843, Eta Carinae suffered its explosive giant outburst, which created the well-known two-lobed “Homunculus” nebula, plus a fast shock wave porpagating ahead of the Homunculus. New evidence for this fast material is reported here. As time procedes, both the faster shock wave and the denser Homunculus nebula expand and fill the interior of the old shell. Eventually, we see that the faster blast wave begins to catch-up with and overtake parts of the older shell, producing a bright fireworks display that heats the older shell. Credit: Gemini Observatory/AURA/NSF/Artwork by Lynette Cook. Light echos occur when the light from bright, short-lived events are reflected off of clouds of dust, which act like distant mirrors redirecting light in our direction. Like an audio echo, the arriving signal of the reflected light has a time delay after the original event due to the finite speed of light. In the case of Eta Carinae, the bright event was a major eruption of the star that expelled a huge amount of mass back in the mid-1800s during what is known as the “Great Eruption.” The delayed signal of these light echoes allowed astronomers to decode the light from the eruption with modern astronomical telescopes and instruments, even though the original eruption was seen from Earth back in the mid-19th century. That was a time before modern tools like the astronomical spectrograph were invented. The Great Eruption temporarily promoted Eta Carinae to the second brightest star visible in our nighttime sky, vasty outshining the energy output every other star in the Milky Way, after which the star faded from naked eye visibility. The outburst expelled material (about 10 times more than the mass of our Sun) that also formed the bright glowing gas cloud known as the Homunculus. This dumbbell-shaped remnant is visible surrounding the star from within a vast star-forming region. The eruptive remnant can even be seen in small amateur telescopes from the Earth’s Southern Hemisphere and equatorial regions, but is best seen in images obtained with the Hubble Space Telescope. The team used instruments on the 8-meter Gemini South telescope, Cerro Tololo Inter-American Observatory 4-meter Blanco telescope, and the Magellan Telescope at Las Campanas Observatory to decode the light from these light echoes and to understand the expansion speeds in the historical explosion. “Gemini spectroscopy helped pin down the unprecedented velocities we observed in this gas, which clocked in at between about 10,000 to 20,000 kilometers per second,” according to Rest. The research team, Gemini Observatory, and Blanco telescope are all supported by the U.S. National Science Foundation (NSF). “We see these really high velocities all the time in supernova explosions where the star is obliterated.” Smith notes. However, in this case the star survived, and explaining that led the researchers into new territory. “Something must have dumped a lot of energy into the star in a short amount of time,” said Smith. The material expelled by Eta Carinae is travelling up to 20 times faster than expected for typical winds from a massive star so, according to Smith and his collaborators, enlisting the help of two partner stars might explain the extreme outflow. The researchers suggest that the most straightforward way to simultaneously explain a wide range of observed facts surrounding the eruption and the remnant star system seen today is with an interaction of three stars, including a dramatic event where two of the three stars merged into one monster star. If that’s the case, then the present-day binary system must have started out as triple system, with one of those two stars being the one that swallowed its sibling. Eta Carinae is an unstable type of star known as a Luminous Blue Variable (LBV), located about 7,500 light years from Earth in a young star forming nebula found in the southern constellation of Carinae. The star is one of the intrinsically brightest in our galaxy and shines some five million times brighter than our Sun with a mass about one hundred times greater. Stars like Eta Carinae have the greatest mass-loss rates prior to undergoing supernova explosions, but the amount of mass expelled in Eta Carinae’s 19th century Great Eruption exceeds any others known. Be the first to comment on "Fastest Jettisoned Gas Ever Measured from a Stellar Outburst"